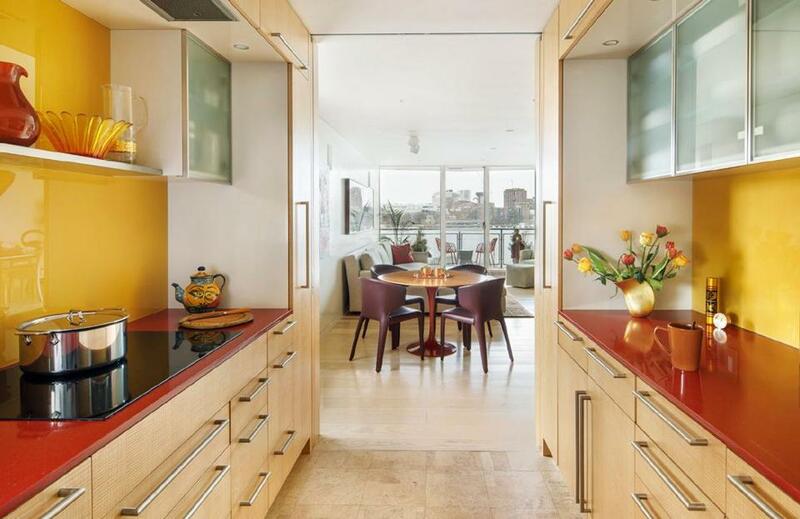 A gut rehab offers stunning Charles River views and sleek accommodations for a Boston couple as they grow older — including wider doorways that can fit a wheelchair. When it comes to views, if you’ve got them, flaunt them. The Millers, who downsized from a nearby condo in a town house, were attracted to the perks of a larger building, namely the elevator, concierge, garage, and gym. “It’s an important building with an iconic modern design that can also accommodate their needs as they age,” Faulkner says. AFTER: Homeowner Annette Miller reviews a script in her office, where programs and posters from shows she’s performed in now adorn the wall. 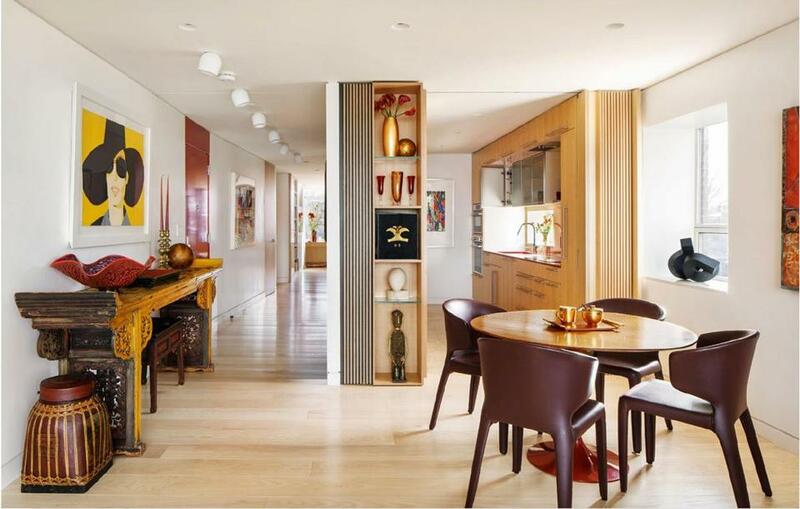 She reworked the wonky intersection to establish a clear, generous axis from one end of the condo to the other. Substantially expanding the opening to the den for a 5-foot-wide door allowed perfect alignment with the main hallway. 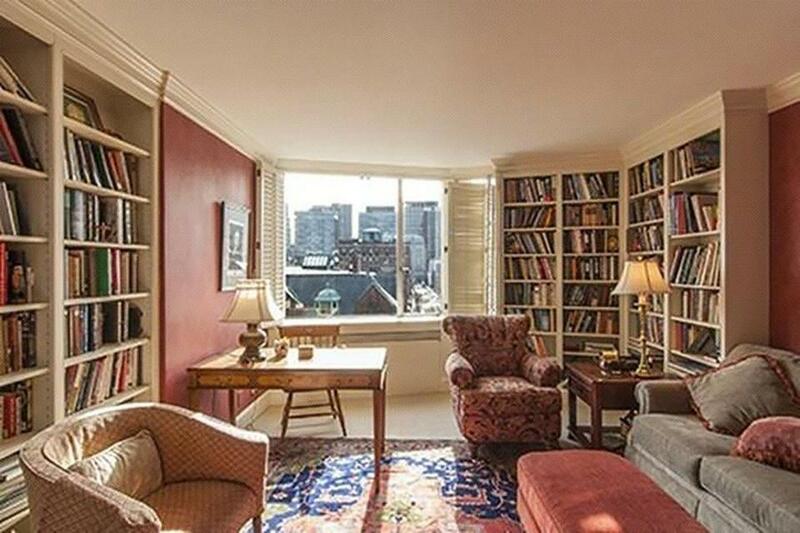 Today when guests enter the home and look to the left, they have a clear view down the hall, out the windows over Michael’s desk, and across Back Bay rooftops to 200 Clarendon Street (the John Hancock Tower) and beyond. Wider doorways also accommodate a wheelchair, in the event that one is needed someday. The den is where Michael, a retired lawyer and business executive, relaxes and works, and where the couple watches television in the evening. Both the den and Annette’s office, next door, hold built-in custom desks, shelving, and file drawers that maximize storage and preserve open floor space. Annette, an award-winning stage, film, and television actress long associated with Shakespeare & Company in Lenox, uses her space to read scripts, often with colleagues. On such occasions, she can shut a glossy white door to block access to the master suite, where Faulkner enlarged the bath and carved out a dressing room. “Annette’s office is comfortable for visitors and doesn’t compromise the couple’s privacy,” says the architect. BEFORE: This is Annette Miller’s office before the remodel was completed. Faulkner modified the kitchen, too, repositioning a wall to create an airy galley with ash-veneer cabinetry. It’s organized with older people in mind: Pots are stored in drawers with easy-to-grab pulls to minimize bending down, and overhead storage is confined to smaller items. The cork-tile floor is durable and comfortable. A red quartzite countertop paired with a marigold-colored back-painted glass backsplash reflects Annette’s love of rich color. The kitchen, which can be closed off with pocket doors that disappear behind pleated woodwork, opens to the breakfast area. The table — a red-painted Saarinen tulip pedestal with a thin lacewood top made by an artisan in the Berkshires, where the couple own a second home — sat in a bay window at their old condo. The Millers brought much of their existing furniture with them, including the Cassina sectional and glass waterfall coffee table in the living room. 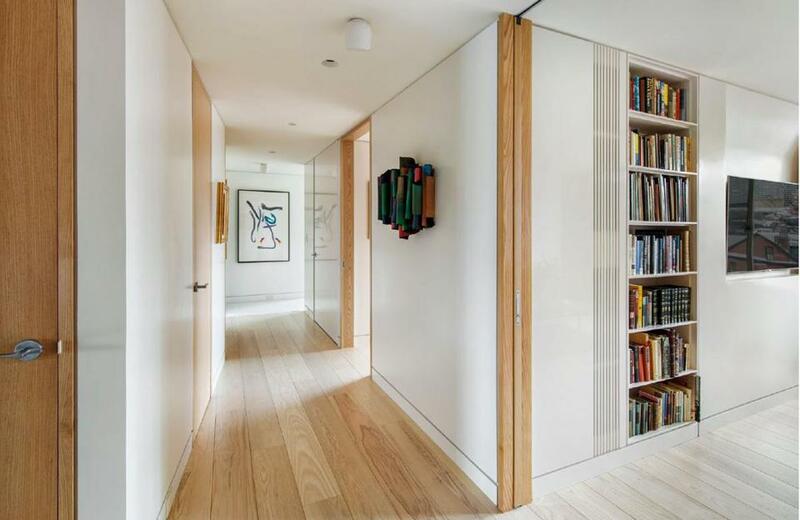 The corridor that leads to Annette’s office and the master bedroom suite runs perpendicular to the entry. The leather wall sculpture is a local find; the framed watercolor at the end of the hall returned with the homeowners from Japan. The den is in the foreground. 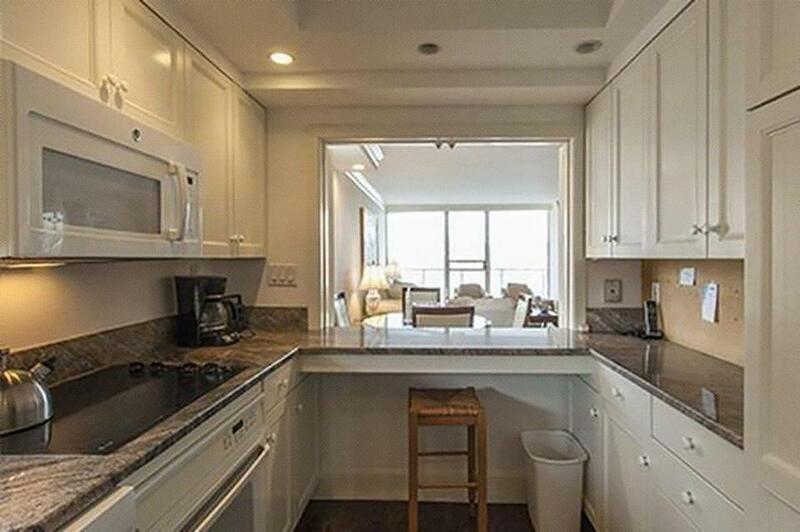 New built-in cabinetry at the back of the sun-filled living room conceals mechanicals and stores formal dishware. A new Molteni&C dining table extends to fit the entire family. “It was very important for me to seat my complete family — children and grandchildren,” Annette says. 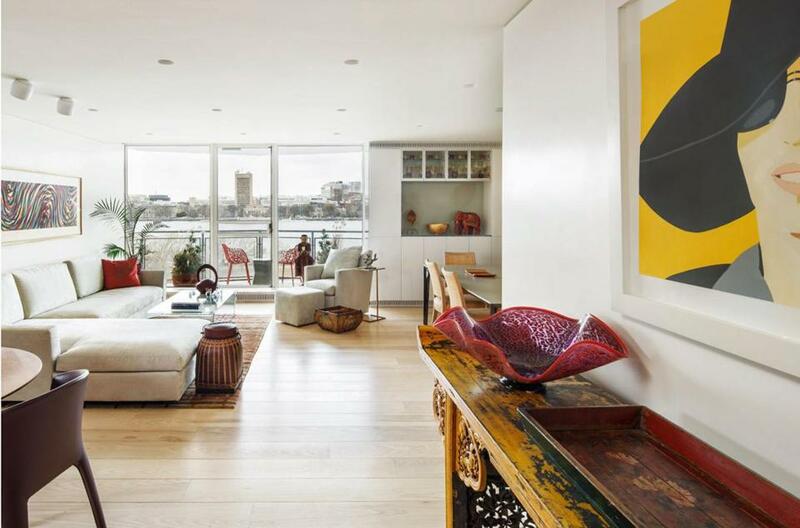 The Millers’ contemporary art collection and a lifetime’s worth of other treasures also made the move. Although almost none of the pieces are new acquisitions, Annette finds that friends comment on them much more now. They also remark on the natural illumination of the space. BEFORE: This is the living room before the homeowners undertook the remodel project. 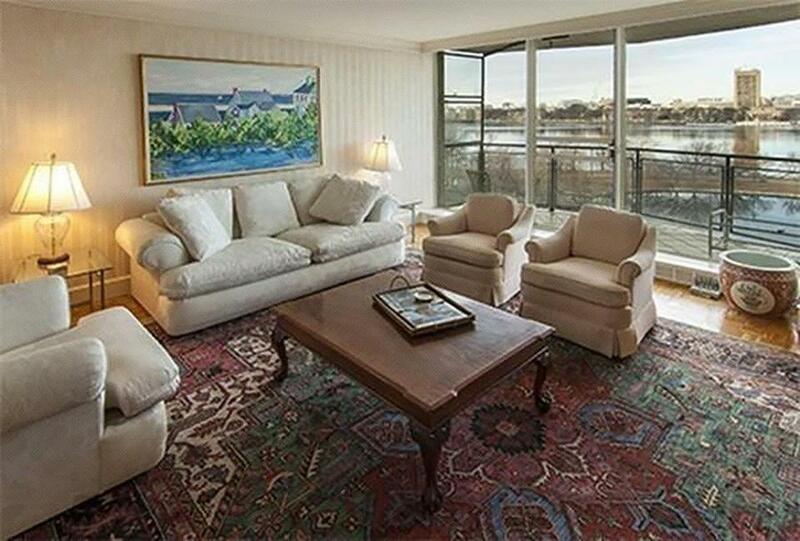 AFTER: The living room overlooks the Charles River beyond the balcony. AFTER: Annette displays pieces from her glass collection on the shelf above the cooktop in the sleek new galley kitchen. The eggplant-colored leather chairs at the breakfast table are by Cassina, from Casa Design in SoWa.